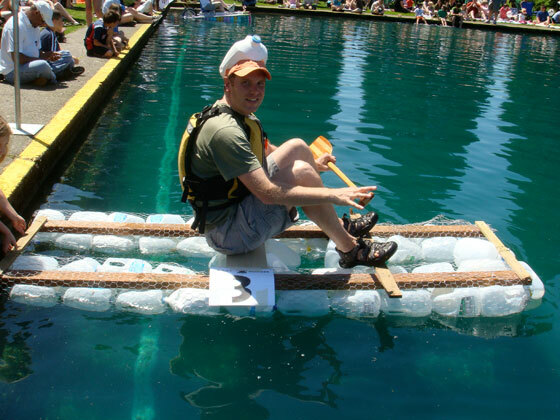 Sign Up for the 2011 Milk Carton Boat Race! 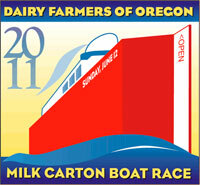 My favorite Rose Festival affiliated event returns in 2011: the Milk Carton Boat Race! Race day is June 12th (11am), at the Westmoreland Park casting pond. After a seven year hiatus the race I obsessed about as a kid returned in 2009. If you’re going as a spectator I recommend you read my reviews of the 2009 and 2010 events so you’ll know what to expect (e.g. no beer garden?!). The basics: Bring a blanket (or lawn chairs) and a picnic lunch and enjoy the spectacle! There are four classes of racing boats: children, adults, family/multi-rider, and corporate. Deadline to register is June 8th at 11:59pm! Visit the event website for more information. Follow @MilkCartonBoat on Twitter for the latest news. Friend of the blog Mike Vogel raced last year! Photo courtesy Heather from Mile73.com.